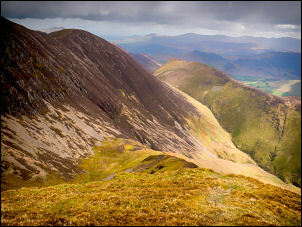 Newlands Hause, Keskadale, Ard Crags. 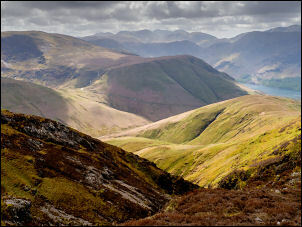 Addacombe Hole, Windope, Whiteless Pike, Bleak Rigg, Sail Beck, Cumbria. I set off in the rain to drive north along the M6 motorway which was drizzly and gloomy with mist over Shap. 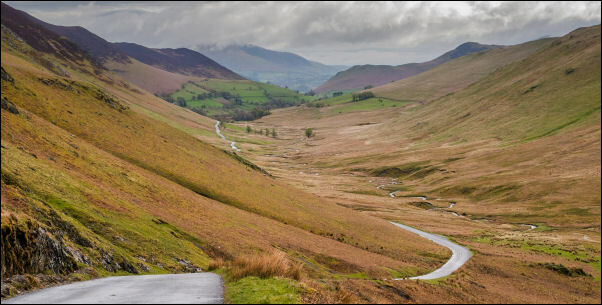 I left at Penrith to head west passing Keswick and on to Braithwaite where I followed the minor road up Newlands Valley. 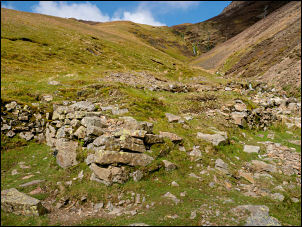 I continued to Newlands Hause summit where there is a small car park. I started my walk by returning down the road I had driven up. The first part is a steep descent of 20% and then it eases on the approach to Keskadale Farm. Before reaching the main path up onto the fells I noticed a green track up to the left so I followed it up the fell side. It had one switch back and it allowed me to bypass the farm completely. Higher up it followed an old wall where there was a terrestrial aerial for the farm. 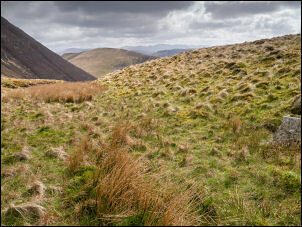 I soon reached the main path heading southwest up the ridge towards Knott Rigg. The weather began to improve and when I reach the summit ridge there were patches of sunshine. At the ridge I turned right to continue northeast climbing up towards Ard Crags. The wind was now getting very strong and it felt quite cold. I checked the temperature to see that it was 2 degrees C. Before the summit of the Craig I took a very minor path diagonally down to the left which met the main descent path at the saddle of the pass below. Site of my old camp in Addacombe Hole. I turned left into the valley of Sail Beck following the lower path roughly along the contour. It was an excellent path and I followed it to Addacombe Beck where I stopped to inspect some old ruins. I doubt were old buildings and were probably sheepfolds. This is where I left the main track and headed straight up the hillside where there is no discernible path of any kind. I followed up roughly parallel to Addacombe Beck and then into the high hanging Valley call Addacombe Hole. 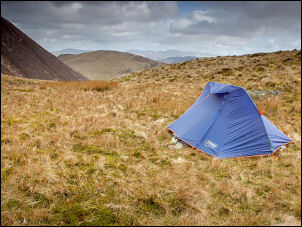 This is where I’d camped on Thu 13th Apr 2006 while back-packing from Keswick to Coniston. The location of my old camp was excellent as the ground was flat and dry and nearby a spring issued crystal clear water. I was hoping this may be somewhere to camp in the future but there was no phone signal of any kind. When I was here last I left the valley by climbing up the ridge to the west. However I wanted to check if there was water high up the valley and possibly a signal so I continued climbing past an old sheepfold and up the very steep scree sides. Although I found a small spring there was nowhere to pitch a tent and still no signal. I reached the main path at the top and followed it to Wandope summit where there is a small cairn. The wind made walking very difficult and I had a steep rough descent down Whiteless Edge to Saddle Gate. 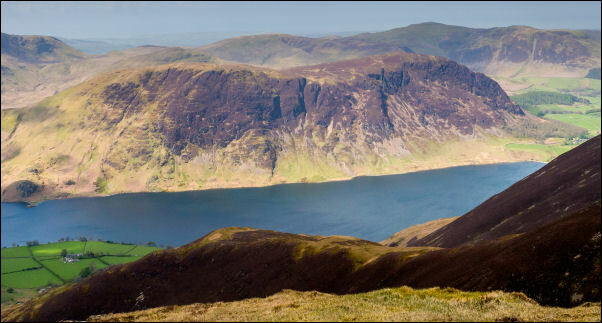 At Whiteless Pike I continued steeply down but instead of continuing on the main path I turned left to follow a sheep track along the fell side to Bleak Rigg and down to Sail Beck. At the valley bottom the river is too wide to hop over but I managed to wade across without difficulty. 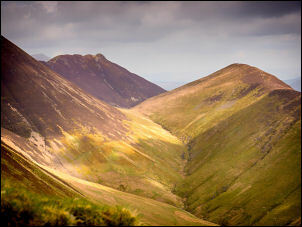 I’d seen a diagonal faint track heading up the fell side in the direction of Newlands Hause so followed it. It was very wet in places but much better than having to descend all the way to Buttermere and then climb back up again via the road. I reached the road just below the summit and walked the last few metres back to the car. In spite of a short shower of hail and rain the weather had improved considerably. I hadn’t seen a single person the whole way round.